Something about summer makes me want to dress up a little more for work. I know, I know, shouldn't I want to just hang out in shorts and a tank top? We have a casual dress code in my office, so in cold weather I tend to wear jeans and flat boots, day in and day out. As soon as it gets warm, I get excited to break out my fancy skirts and dresses and heels. 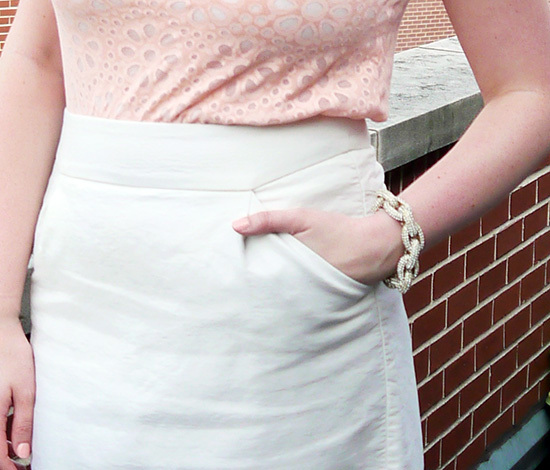 I may have been wearing this white pencil skirt a tinge too much, I want to break it out every day. Something about it just screams summer to me. You know, like the color. I took these pictures early in the morning, and now I know that before work I look really tired and my hair retains some "natural wave" from rolling around in my sleep. You win some, you lose some. SO pretty! Loving the white and pale pink combination! This skirt fits you perfectly–you look stunning! That eyelet top is just gorgeous! This is a perfect summer work look! You look beautiful in this outfit Kristina! I totally feel you on wanting to dress up sometimes for work, my dress code is yoga pants lol. But on the off-chance I'm only working the desk that day, I always want to dress up! Such a pretty, delicate top and I love the background on the rooftop. I'm with you on this one - summer makes me break out my skirts and dresses. The fall is the return of the black skinnies until summer comes back again! Lovely look - I've always loved a white pencil skirt! white is so summer! i think my work wardrobe really needs a skirt like that. You are too cute ;) You definitely can't go wrong with a white skirt either! I'm honestly just impressed you're awake enough in the morning to take blog photos. 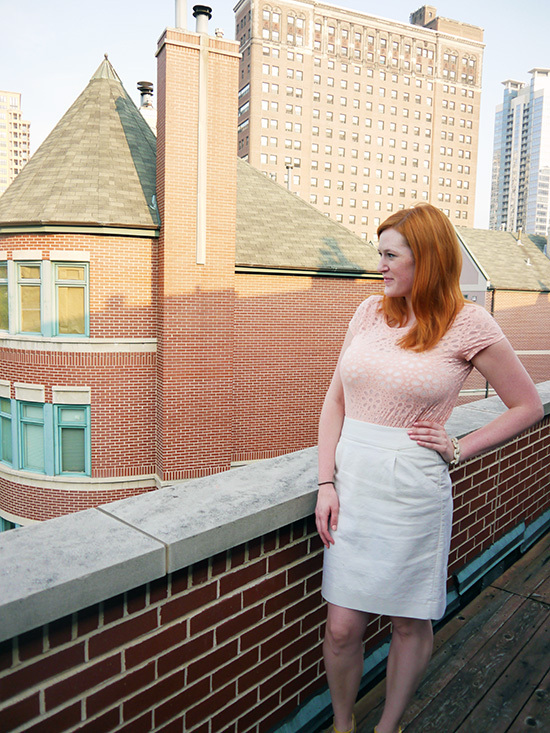 I have a top from Loft just like this, and you're making me want a white pencil skirt! I just made a post about getting blogger to stand out! Oh, awake but barely! You should definitely get one! You should get one! It's super versatile. I know I'm not there yet, but soon I'm going to be super excited to pull out my jeans and boots again. I love some good cutoffs and tanks too, that's what I'm wearing right now! Love this outfit! I've been wanting a bracelet like that too. Really love this outfit! So feminine and sophisticated. Looks amazing on you!